The major difference between a buy and hold investor and a trader. And if we were to just take Dow Jones as an example to compare between the trader and the buy and hold investor. As traders, (1) we traded down and profited and (2)we are out of this trade, which means our funds are not locked in from the trade anymore so that we can almost immediately utilize the same set of funds to take advantage on other profit opportunities on the markets whenever it arises. Buy and hold or long term investor will not be able to do this because (1) they buy and hold and the Dow Jones going down means they have to hold on to losses. (2) Buy and hold investor because they are still in their investment, means their funds are locked in and if other profit opportunities arises, they either have to make more funds available to take advantage of those opportunities that arise or forgo those opportunities. Buy and hold will be profitable when the market goes up but not so when it comes down. Trading is different in the sense that when market goes up, you can trade up to profit. And when markets goes down, you can trade down to profit as well. More opportunities for profits for traders than compared with buy and hold investors. And because we traders can trade bi-directional, the opportunities for profit almost doubled. Therefore it is possible for a trader to grow their wealth double quick time compared with a buy and hold investor. So the thing is this. And this is true as well. The opportunity for loss is also double for traders. And this is especially true for traders who do not have a proven and tested strategy that works. In fact without a proven and tested strategy, the end result most likely for trading any instrument (be it options, stocks, forex or even indexes and commodities) will be overall loss. Or what I called financial suicide on your money. This is why we at Online Guru Trader have been trying to help the community in terms of that ONE trading strategy for success. And as you can see, our profits this year are already over 15% on our money. (please scroll down to view the screen shot of our profits). We are killing it regardless the market is going up or down this year. We really like to help you get it as well. So join our community by signing up for free by clicking on our sign up button on our page, and we will be sending you some FREE TRAINING on what and how to have consistent trading profits for success. And in case if you are wondering if there is any catch! There isn’t and here’s why! It’s our way of saying thank you for being a loyal supporter of our business page so far. Because (unlike other “guru’s”) we don’t make all of our money teaching others how to make money from trading (we actually trade with real money on the various markets from options, stocks, forex and more)… so because of that, it doesn’t hurt us to share with you our best stuff. And if we get one of our products in your hands, and when you see how awesome it is, hopefully it should get you excited to buy other stuff from us in the future. You may be just one step away from the finishing line. You are ONE strategy away from trading success! See you and we’ll talk more after you’ve signed up. Just want to say sorry to those who copied me in Sirix platform. I did not live up to expectations. The best I did was to reaped in 26% return on capital in about 4 months from 3rd June to 4th October last year when I was very active and focus trading this account. After that, I had a draw-down of about 12% and may have cost some of you copiers out there to lose some money. This is because I lost focus due to the many other accounts (options, futures, stocks, CFDs, forex) that I’ve to trade and results suffered. And I am truly sorry to those who copied me when I was having the 12% draw-down. So I will be doubling my efforts to trade this account from now till it reflects a 30% return on capital to ensure everyone who has copied me made money. Now it’s at about 20% so its just another 10% more to 30%. After that happens, I’ll be sure that everyone who copied me even those who copied me during my draw-down would have made some money. Thanks for staying on even when I had the draw-down and believing in me. For that, I’ll not let you guys down. Our trade alerts account only reaped in $900 plus in 4 months as posted in our previous post. It also reaped in over 10% return on capital in 4 months. 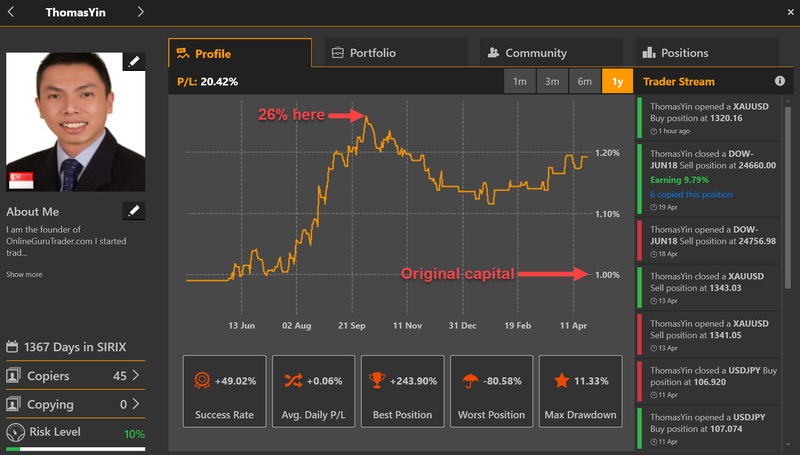 We used a small account for our trade alerts service to show that anyone can profit and get over 10% return on capital in 4 months regardless of their capital amount or account sizes. So if you have a bigger account, you STILL get over 10% return on capital but your profit amount in dollar terms will be different. Percentage wise is the same but amount wise in terms of dollar terms will be different due to different amount of capital used. Here’s a screenshot of another account of ours following our trade alert service to trade reaping in over 10% return on capital and a overall profit amount of more than $6000. Click on the sign up button on our page now to get started. Made a winning trade for my trade alerts community members this week. Was able to not just cover the losses last week but STILL be overall profitable! Please join our group at https://www.onlinegurutrader.com/freemember/ to find out more. Lastly, congrats to all our loyal and supportive members since the start of the year. We are happy that our trade alerts is up over 10% return on capital and that it helped you to achieve the same. We are glad to be part of your trading success and overall consistent profitability. For those who are wondering if my trade alerts works for much bigger accounts, then check out my screenshot of another account of trades following my trade alerts. Like what I mentioned in my previous post, did a lost this week. But as you can see, just factoring the most recent 2 winning trades were able to take in all the losses for the year and still post a overall profit. Check out my previous post if you want to learn how I kept my losses so small that a couple of winning trades can wipe out all all my losses and still post a overall profit. 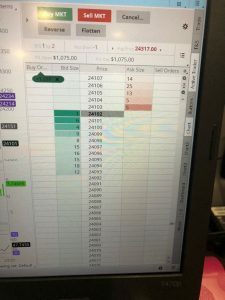 I made a losing trade this week for my Trade Alerts 2.0 service. Before you click on my screenshot to take a look, I have this story to share with you. A guy walk up to me this week and told me he registered for my talk 3 years ago but didn’t managed to attend it back then. We had a short chat and we came to the topic of trading. He then said he don’t put stop losses because the markets always hit his stop loss orders. my 2 most recent winning trades would have brought my account to be overall profitable even if I factor in only this 2 winning trades and all 5 losing trades I made this year. 2/7 win rate or 28% win rate is still possible to be overall profitable because I keep my winners and cut my losers. If you don’t put stop loss, you’ll always tend to lost more than you planned or hope for when markets go against you. Not having stop losses in place is like not having a safety net below you while walking on the high wire in the circus. If you want to be successful in trading, put that safety net, put that stop loss, even if it hits many times. Always keep your winners and cut your losers. May the market be with you always. So I did a video on how I did my analysis, send out a trade alert and profit just by following my own trade alert. Check out the video to see how easy it is to just follow my trade alerts and profit from it without being chained to your computer all day. Just for yesterday Friday alone, that one day of trading, I was pretty sure that the US stock market was going down. Not because of non-farm payroll or any news for that matter. But because the technicals, shows that it was very bearish and I was just looking for opportunity to get in to short regardless of the news or any news. I even stated my view on my facebook page very clearly. I applied my TTW strategy, used the tick charts, and got an entry to short with a tight stop loss as usual. The rest is history. Profits of over US$1000 in less than 2 hours. Check out the screenshot that I took before I got out of that trade with profits.